A while back, Nintendo's homegrown fighting franchise wasn't showing up on the list of games that would be featured at Evo 2014, this year's edition of the world-renown fighting game tournament. Wasn't on the rolls for Major League Gaming's Anaheim championship event, either. 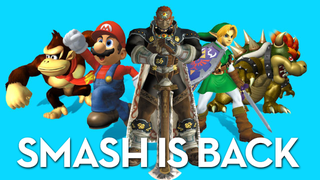 But, now, months after fans protested the absence of Mario, Star Fox and Samus with the #FreeSmash hashtag, Smash Bros. is coming back. Shoryuken is reporting that Nintendo's approved Smash's inclusion in 2014. It needs to be said that this is Smash Bros. Melee that will be in the Evo and MLG events, not the still-in-development sequel that's due out later this year. Still, Smash's return to the rosters of big-deal video game tournaments is noteworthy, especially since it's coming after Nintendo's misguided attempts last year to remove Smash from Evo's streams and schedule. Hopefully, this year's Smash presence will be drama-free. Except for the fights, of course.